Me, madly chopping cauliflower and carrot in the food processor with three pans cooking on the stove. He comes into the kitchen and sees the outside part of the cauliflower and says, "What’s this? What are we having? Is it cabbage?" There is some discussion about what this vegetable is, but I refuse to tell. He goes upstairs to get changed. Enter son, Tommy, who is 19 and VERY hungry after a day at Uni. He’s so gorgeous that he gently asks, “When’s dinner, Mum?” when I know he just needs to eat something AS SOON AS POSSIBLE to avoid starvation! I answer, “About 10 minutes!” a bit frantically because I have three pans going and I really don’t have enough room in my kitchen! He lopes off to his room while I finish up. Finally, the creation is finished, the dinner bell is rung and it’s with a bit of fear and trepidation that I let everyone come and help themselves from the pot on the stove. Why? Because many, many years ago I made my first Risotto and my kids christened it, “Revolto.” Sadly it was not a hit. :( And that one included rice! Here I am trying to serve up grain-free risotto and hoping for a better outcome! Middle child, Daisy who is 18, appears first and peers in the pot, “Is there rice in this?” she asks. (She’s not eating grains at the moment.) I reassure her that no, there aren’t. Hubby appears next and we have the "Is it cabbage?" conversation again and he still doesn’t guess it is cauliflower. Daisy tells him but he seems keen to try it anyway. Lastly, youngest child, Jasmine (17) helps herself. She’s keen to give it a go and really is more distracted by her Year 12 final exam the following day than what she is eating. I’ve made this recipe easier since that first time. I’ve found you only need two pans and if you had already cooked the chicken (or used a BBQ'd chook) it’d be even easier. I haven’t seen a cauliflower and carrot risotto before, but I decided to throw them in as I was too lazy to chop them all up to add with the asparagus. I liked the way it turned out; the carrot added some colour and sweetness. 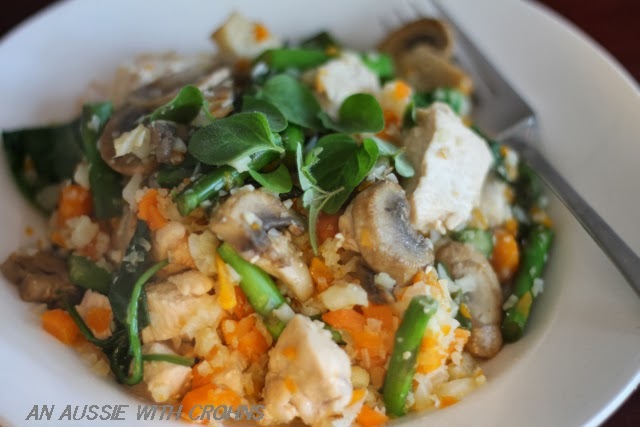 Cauliflower & Carrot Risotto with Chicken & Mushroom. Dice onion and brown in a large saucepan. 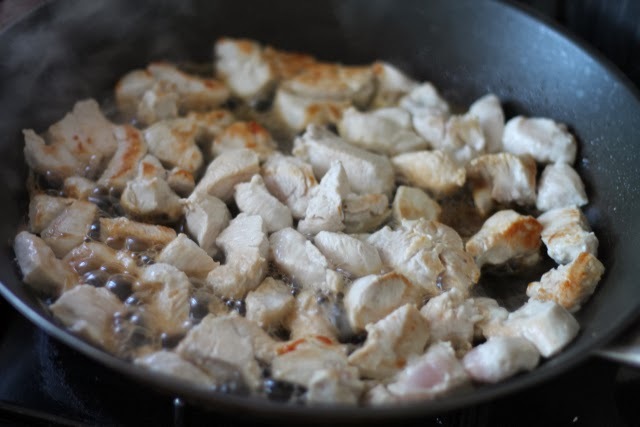 While that's cooking, chop up your chicken into bite sized pieces. Brown the chicken in a little oil in a separate fry pan. (mine takes 2 batches). Chop the cauliflower into large chunks and process in a food processor until the size of rice. Take cauliflower out of the processor and put into a bowl. Peel carrots and chop in the food processor until the size of rice. Put the chopped cauliflower, carrots and the chicken stock into the large saucepan with the browned onions. Put on the lid and a medium/high heat until stock boils. Then turn heat to low/medium and leave to simmer as you cook the chicken. As the chicken cooks, place it in a bowl with a lid to keep warm. When all the chicken is cooked, stir fry the asparagus and mushrooms in the pan until done to your liking. 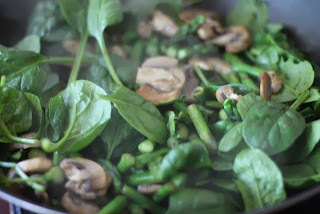 Throw in the spinach leaves and oregano for the last couple of minutes. When everything is cooked, toss the chicken and veggies through the cauliflower & carrot mix. Season with salt & pepper. A squeeze of lemon on top is nice, too. Notes: It takes around 10-15 minutes for the cauliflower & carrot risotto to cook, but you can turn it off and leave it on the stove while your chicken & veg finish cooking, if necessary. Any other veg would also suit this recipe. Green beans would be a good sub for the asparagus. You can just use water instead of chicken stock, but the stock does give the cauliflower more flavour. Have you joined the fun on Facebook, Twitter and G+? See my new widget (top right). Have you checked out SCDelish yet? Hi! what oil did you use for this? Made this last night and loved it, I had some leftover Chicken so it was a very fast and easy meal. Next time I will add some fresh Parsley and Rosemary to boost the flavour.